With its less oil absorption properties, Fortune Cottonlite Oil ensures that every home-cooked meal is healthy and light. Besides having a neutral flavour, our cooking oil retains its quality even at high temperatures, making it ideal for deep frying. This unique formula ensures that the freshness of food remains intact for a longer duration when cooked in Fortune Plus Cottonlite oil. It removes light sensitive fatty acids from the oil which causes rapid development of rancidity in food cooked in it when exposed to light. It is high in tocopherols which give products longer shelf life. Contains a high amount of antioxidants which are essential for good health. Rich in Vitamin E, which like antioxidants, is important in fighting free-radicals. Great for deep-frying as it is known to enhance the flavour of fresh foods instead of hiding them, unlike some other oils. Has high oxidation-resistance which makes it ideal to be used for salad dressings. 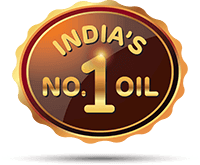 Can be used in rotation with other oils such as canola oil, groundnut oil, etc. as part of a healthy diet. It has a light, neutral taste that is loved by people who do not like oils with strong flavours. Cottonseed oil is rich in Tocopherol, which is a form of Vitamin E. It is known as an antioxidant superhero that keeps food fresh for a longer duration and protects our skin. It makes up 96% of our skin’s natural antioxidant defence system. There’s also preliminary evidence that it can help prevent scarring and reduce the signs of aging, too. Studies are underway to learn more about the many ways tocopherol and other forms of vitamin E benefit skin and overall health. lower by up to 17% on average, as tested in government approved laboratory.